A belly full of laughter, a super-soaked audience and a magical musical duet is what Potted Potter brought to the Algonquin Commons Theatre at 8 p.m. on March 15. Potted Potter is an unauthorized parody experience of Harry Potter where two actors portray over 50 characters in 75 minutes over the course of seven books. The show was held at the ACT from March 13 to March 16 – with two shows kicking off the final day. Friday night’s show had well over 500 Potterheads in the audience. Potted Potter stars Scott Hoatson and Jonathon Saunders. Hoatson played Harry Potter while Saunders was every other character in the series including Ron, Hermione, Professor Snape, Draco, Lord Voldemort, Mad-Eye Moody, Lupin and Sirius Black — to name a few. The two actors went one-by-one through the books and recapped them all in a humorous manner. With a video presentation of book three in lieu of them acting it out, a musical parody in the style of I Will Survive sung by Harry and Voldemort for book seven and the losers of the quidditch game being sprayed with a super soaker, they had the entire audience erupting in laughter throughout the night. Throughout the show, the cast came in and out of character, with Saunders stopping to crack jokes like mixing up a warthog and Hogwarts. The actors made odes to J.K. Rowling, joked about Trump and referenced the Lord of the Rings, Game of Thrones and Stranger Things. They also broke the fourth wall and interacted with the audience asking two participants from the front-level to go on stage and catch the golden snitch. A group of friends won tickets for front row seats to the show on Friday night. They weren’t Potterheads themselves, but the experience opened their minds. “The performances were amazing. They were extremely energetic and they carried that energy the whole way through,” said Agathe Winsom, one of the ticket winners. Potted Potter first began as a street show and was later turned into an hour-long performance on Aug. 4, 2006 in Edinburgh. The show’s writers and creators Daniel Clarkson and Jefferson Turner first brought Potted Potter to Canada in Toronto at the Panasonic Theatre in 2006. 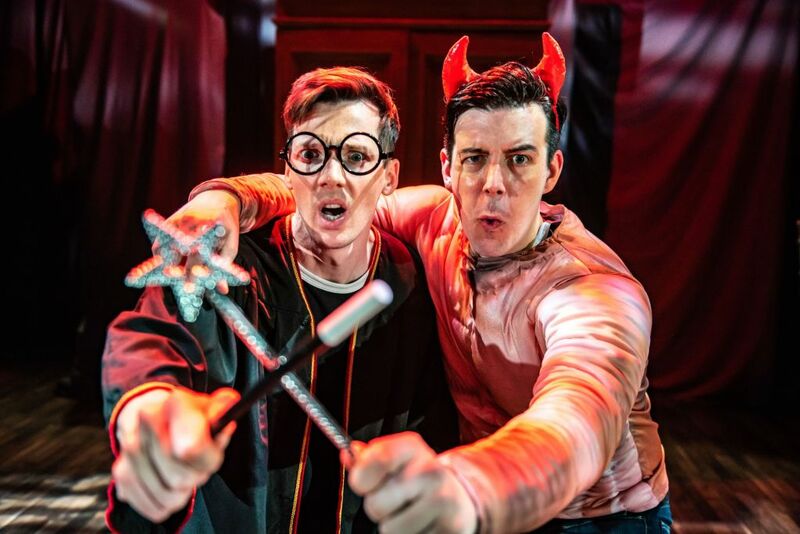 Potted Potter gives an un-expecto performance to muggles Reviewed by Emily Britton on March 19, 2019 .